NEW YORK, New York — On March 20, President of Nagorno Karabakh Bako Sahakyan signed an executive order granting a Medal of Gratitude to Ara Boyajian, member of Armenia Fund’s Board of Trustees. The medal was bestowed on Mr. Ara Boyajian in recognition of his longtime contribution to the economic and infrastructure development of Artsakh. The honoree has been a founding member of Armenia Fund, Toronto since 1993 and a member of the Fund’s Board of Trustees since 2007. 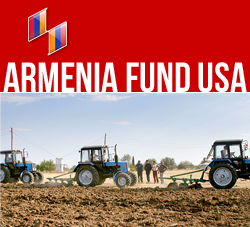 Ara and Calabrina Boyajian are also donors of the Fund and have contributed more than $100 000 US for its development projects. In 1993 Mr. Ara Boyajian was recognized a Benefactor by the Mother See of Holy Etchmiadzin.